Advanced pre-training supplement, containing in its composition compounds accelerate regeneration, stimulant, increasing the size of muscle cells and lifting strength and endurance. 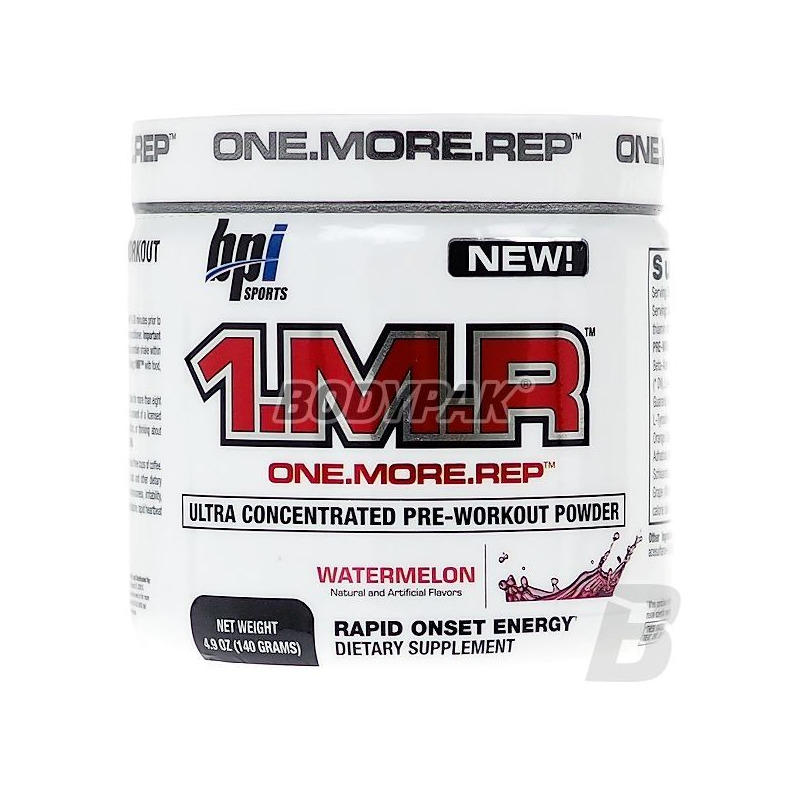 BPI 1.M.R Ultra Concentrated - to supplement the pre-training, in his composition compounds accelerate regeneration, stimulant, increasing the size of muscle cells and lifting power. Alpha-ketoglutarate of L-Arginine - involved in the formation of nitric oxide and thus has the ability to expand the blood vessels, allowing for better blood circulation in the muscles and soft tissues. Indirectly involved in the synthesis of cGMP which, together with ATP is involved in muscle contraction and has an anabolic effect. 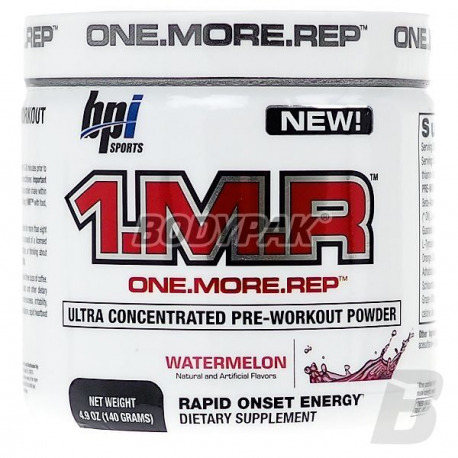 It affects the secretion of growth hormone, is an important precursor for creatine. Beta-Alanine - together with histidine is part of Carnosine, therefore responsible for delaying the process of muscle fatigue during intense workouts. It also creates a dipeptide responsible for "de-acidification of" fast-twitch muscle fibers, making it possible to even more prolonged training and increasing its intensity, as well as accelerate the process of post-workout regeneration and reduction of overall muscle soreness accompanying grueling workouts. Beta-alanine also ensures correct working ATPase, the enzyme involved in the release of energy, which directly translates to an enhanced ability of the body to make an effort. L-Taurine - exerts anti-catabolic (reduces protein breakdown), increases the concentration of nitrogen in the body. N-Acetyl L-Tyrosine - acetylated version of the amino acid tyrosine, which is a precursor to adrenaline, dopamine and norepinephrine, stimulates, increases alertness and concentration. Creatine monohydrate - Participates in the transport and rebuilding of ATP - ATP serves as an energy carrier in our body, without it the course of most reactions, ranging from simple synthesis of the muscle contraction, would be impossible. Creatine for its ability to bind phosphate groups (then transformed into phosphocreatine) participates in these, transport and rebuilding of ATP. Increases the rate of protein synthesis - by increasing the amount of water retained in the muscle cells contributes to a more anabolic (growth promoting) environment. Caffeine Anhydrous - the most famous in the world relationship of a thermogenic. A stimulating effect, reduces the levels of Adenosine inhibits the breakdown of cAMP - thus strengthens occurring in the body processes thermogenic (release of energy created during the combustion of fats in the form of heat) and lipolytic (breakdown of fats into free fatty acids). Paullinia cupana seed extract - contains the most famous in the world relationship of a thermogenic - Caffeine. A stimulating effect, reduces the level of adenosine inhibits the breakdown of cAMP - thus strengthens occurring in the body processes thermogenic (release of energy created during the combustion of fats in the form of heat) and lipolytic (breakdown of fats into free fatty acids). Yerba Mate Extract - derived from the dried leaves of yerba mate. It comprises xanthine alkaloids assigned to the same group as caffeine. What distinguishes the two compounds is the fact that xanthines do not cause side effects such as irritability, convulsions or feeling cold, usually associated with large quantities of caffeine. Extract of the fruit of Schizandra Chinensis - the plant for hundreds of years used in Chinese folk medicine. You can pass it to a group of adaptogens help you adapt to physical stress. Niacin - helps to maintain normal energy metabolism and reduce tiredness and fatigue and helps in the proper functioning of the nervous system and in maintaining normal psychological function. Vitis Vinifera Seed Extract - rich in bioactive Polyphenols, among which we find m.in . : Resveratrol, a powerful antioxidant. Beta-Alanine (As Carnosyn®), L-arginine alpha ketoglutarate, Taurine, Creatine (as Creatine Monohydrate), Caffeine (Anhydrous), Guarana (Paulinia cupana) (seed), Yerba Mate (Leaf), L-tyrosine (N -acetyl_L-tyrosine), Susagle tree (Kigelia africana) (root), orange Citrus Sinensis (Active), Psoralea corylifolia (seeds), Adhatoda vasic (leaf), ginger (Zingiber officinale) (root), Chinese Schisandra (Fruit) Visnea Mocanera (leaf), Vitis vinifera (seeds). Advanced call an anabolic creatine, beta alanine, and many active substances, so that your workout will bring much better results! It provides a solid dose of energy - even in a weaker day (high caffeine content).